If you use Twitter to “get rich quick”, “gains thousands of new followers”, or to learn “teeth whitening secrets” you might want to stop reading. If you’re as sick of Twitter spam as I am, you’re about to get very, very excited. Two days later Doug Braun from Emerge 2 Digital in Waterloo Ontario, Canada emailed to say that he’d seen my tweet, and believed his company could build it. We exchanged a couple of quick notes about potential pricing and features, and I forgot all about it. A week or so ago, Doug emailed to say that TwitSweeper was ready for beta. Gadzooks! How much do I love social media? Plenty, when one tweet results in a software tool that improves my life (and will improve yours). TwitSweeper is incredibly simple to use. You sign up for a plan that costs between $1.59 and $8.25/month, depending upon the number of Twitter accounts and combined followers you wish to “sweep.” (In my case, 1 account and ~ 15,000 followers, so my plan is $2.42/month (There is a 17-day free trial). You connect your Twitter account to TwitSweeper with a couple of clicks, and the sweeping begins. 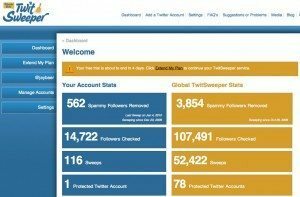 The system “reads” every bio, screen name, URL, and recent tweets of every one of your followers, looking for any of more than 5000 trigger phrases that indicate spam. Subsequently after this initial scan, TwitSweeper reviews each of your new followers, and periodically rescans your entire follower group to make sure they haven’t gone astray like Todd Bridges or Danny Bonaduce. You can also scan for custom phrases that you determine, so if you want to flag any Cowboys fans or people that didn’t like Avatar, TwitSweeper can sanitize your universe. It’s important to note that TwitSweeper doesn’t auto-delete any of your followers (unless you want it that way). It flags them as suspect, and then sends you an email (on an interval of your choosing). Clicking a link in that message takes you to the site, where a list of all of your possibly dicey followers is waiting. A very nice feature is the option to read why a follower was flagged, and to quickly click through to view their profile on Twitter to determine whether you indeed want to dump them overboard. After a little manual tidying, you click a button and your Twitter account unfollows the spammers. Bang! Is TwitSweeper Right For You? There’s no question that Twitter spam is becoming a bigger problem, and I don’t see it become less of an issue organically. In fact, TwitSweeper has a blog all about Twitter spam called The Dustpan. If you auto follow-back people that follow you (as I do), you inevitably will follow spammers. In that case, I absolutely recommend TwitSweeper as an extraordinarily easy way to rid your account of obvious ne’er-do-wells and no-good-niks. If you have a manageable number of Twitter followers, manually decide whom to follow, and do not auto follow-back, then TwitSweeper is most likely overkill for you at this time. For me, $2.42/month is a low, low price to pay for the Twitter version of a do-not-call list. What do you think?